Pro-Russian Separatists Hold "Independence" Referendum in Eastern Ukraine ...Update: 90% of Voters Support "Sovereignty"
Pro-Russian separatists held an “independence” referendum today in Eastern Ukraine. The turnout was reportedly high. Voters in the Donetsk and Luhansk regions, about 15 percent of the Ukrainian population, cast ballots on whether they approved of independence. But it was unclear whether that meant more autonomy within Ukraine, creation of an independent state or possibly an attempt by the Russian-speaking regions to join Russia. Ukraine is holding a presidential election on May 25. 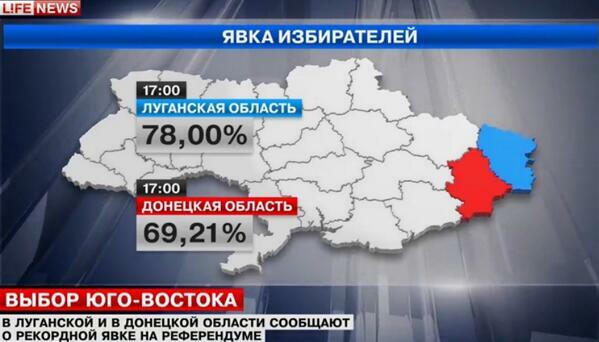 Many in eastern Ukraine appeared to ignore Sunday’s voting. One person said he voted for independence because he wants peace restored. The Donetsk People’s Republic regional leader Pushilin said today Ukrainian troops will be considered “occupiers” after the referendum. UPDATE: Pro-Russian insurgents in eastern Ukraine say preliminary results of a contentious referendum show nearly 90 percent of voters have supported sovereignty for their region.